My original stairs were a lawsuit waiting to happen. The bricks had been shoddily repaired and they were falling apart. The height (rise) of each step varied. The railings and sidewalls of the staircase were collapsing outward. My mailman refused to deliver mail during the winter because the stairs were so dangerous. Tom designed a new granite entrance for my house. He demo’d the existing brick staircase and concrete walkway, removed all debris, supported the portico, refinished the columns, then set my granite stairs and landing. He replaced the concrete walkway with granite pavers. 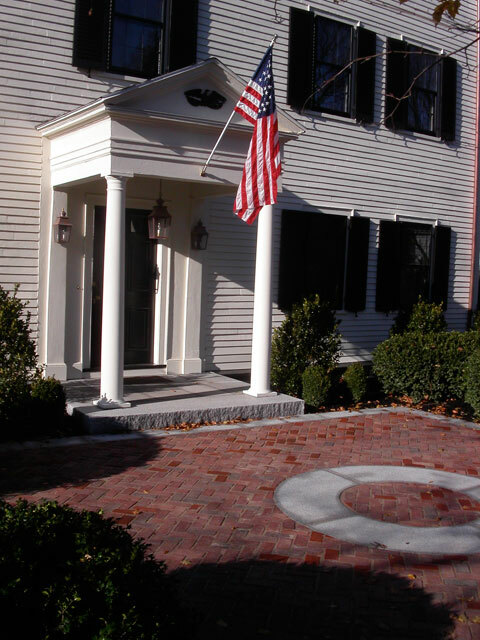 Look around at the older homes in your neighborhood, and they will likely serve as a testament to the beauty and durability of entrances and steps constructed of natural granite. Slopes and elevation changes at the entrance to your home are often viewed as problems to be overcome. Likewise, cracked concrete or crumbling brick steps can prompt a call to the landscaper. 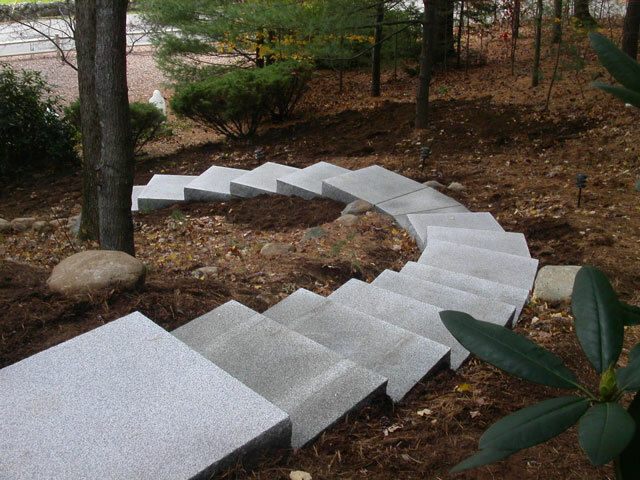 In both cases, the project can be viewed as an opportunity to create a beautiful set of granite steps. Properly installed steps and landings should be attractive, comfortable to traverse, and should last a lifetime -- so even in the design phase of the project, we address all critical details. If the previous structure failed, for example, we would investigate why. 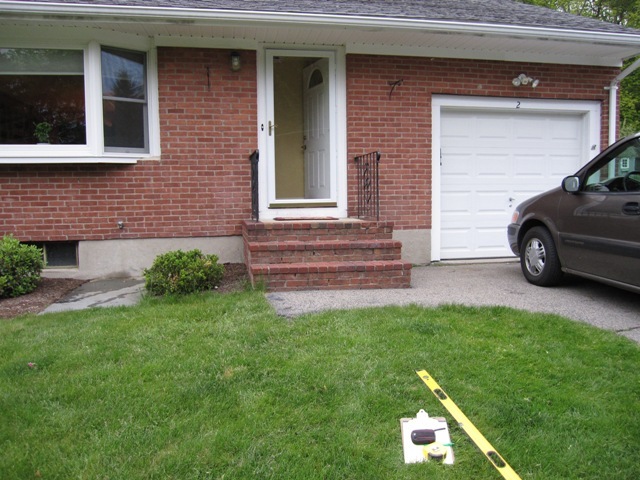 We then measure the slope, exactly, with a transit in order to determine the step tread width to best match the slope. If the steps curve, we also produce a spreadsheet with all the measurements needed for construction. The careful execution of a granite step installation does not lend itself to a large crew. Instead, one or two of us will handle the job in order to maintain a high level of quality control. 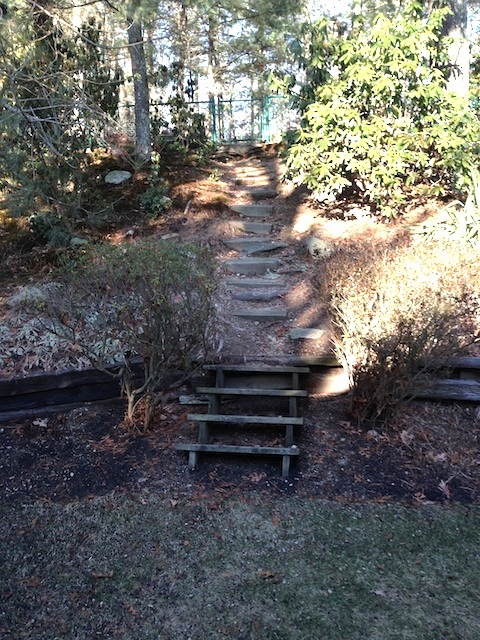 We install the steps one at a time, beginning at the bottom, making sure each step has a properly compacted foundation. We use a Bobcat to transport each step to its approximate location, then use rollers and levers to position it precisely by hand. Since the steps weigh between 400 and 1600 pounds, the installation is both rewarding and impressive. There is always great feedback from the homeowner! A circular granite design with terraced garden and semi-circle landing makes the entrance to this house very special. Large Federal style house integrated new granite with reuse of existing old granite to provide two elegant entrances. Granite steps descend to a spacious full color bluestone landing that transitions nicely to the driveway. Fifteen gently curving granite steps lead from the house to the lower yard through the woods. Large granite steps now sweep to the outside of the lamp post. 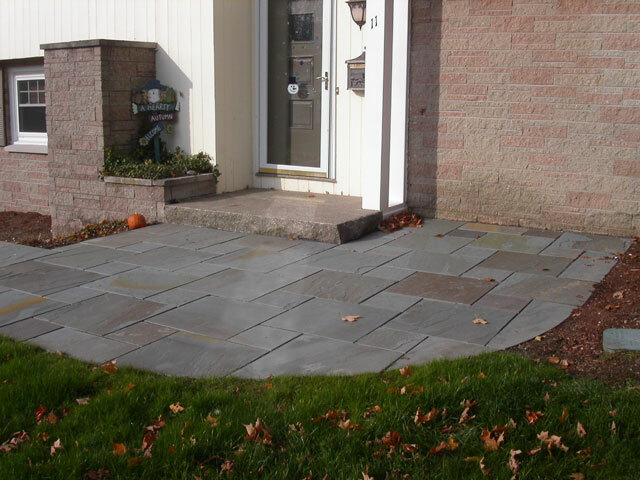 Full color, natural cleft bluestone with a granite landing provide both an entrance and a sitting area. An hour-glass walkway and granite steps provide beauty and allow a graceful interface with the horse-shoe driveway. 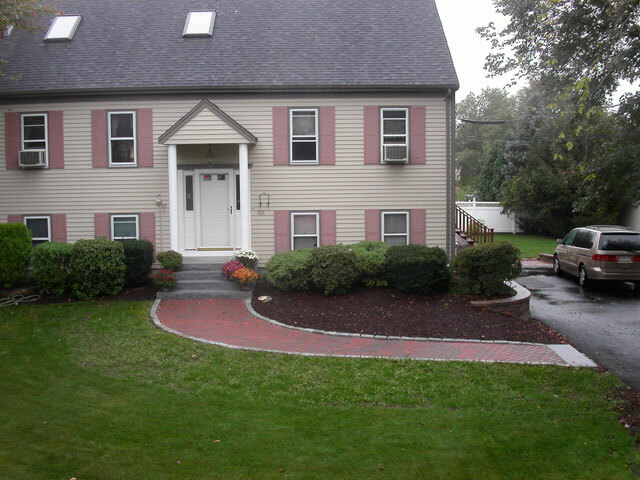 Granite steps, paver walkway, granite wall and garden all combine to create a grand entrance to this home. Granite steps & landing, curving paver walkway, and a new curved retaining wall - make all the difference. 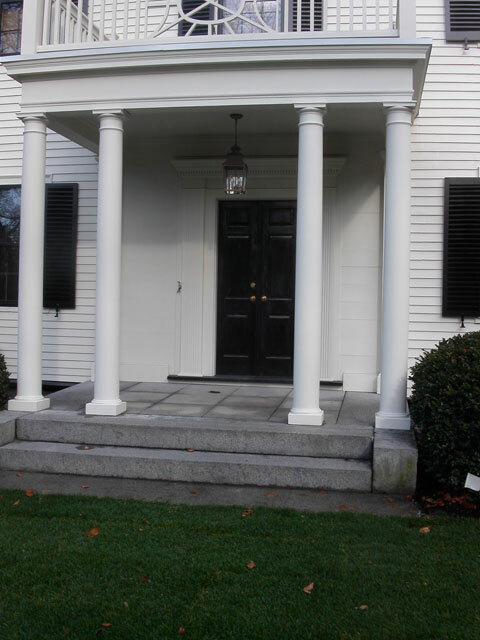 Large granite steps and new portico bring out the classic dignity of this great house. Granite steps far surpass the earlier straight, steep, extra-wide concrete steps at this home built in 1886. The design also replaced a steeply sloping concrete sidewalk (out of view) with a landing area and bluestone walkway. 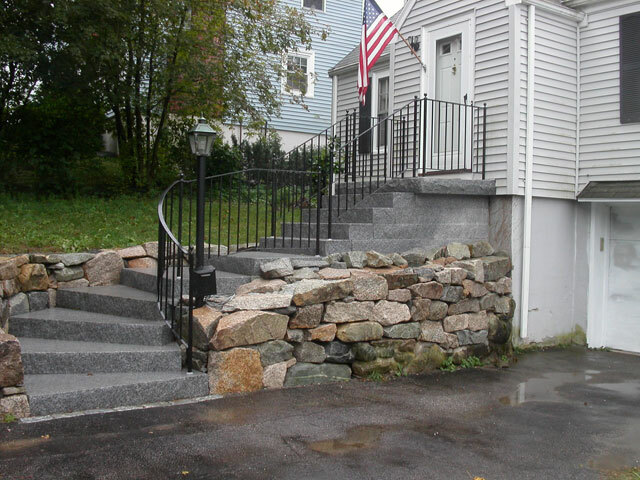 People sometime question whether granite steps fit with a wooden porch. As these pictures show, granite steps can really make the wooden porch pop especially when you add integrated handrails. Large pieces of Goshen stone can produce a unique and attractive entrance. The Goshen stone was set with a 3" gap to grow herbs between the pieces; the herbs are just getting started in these pictures. 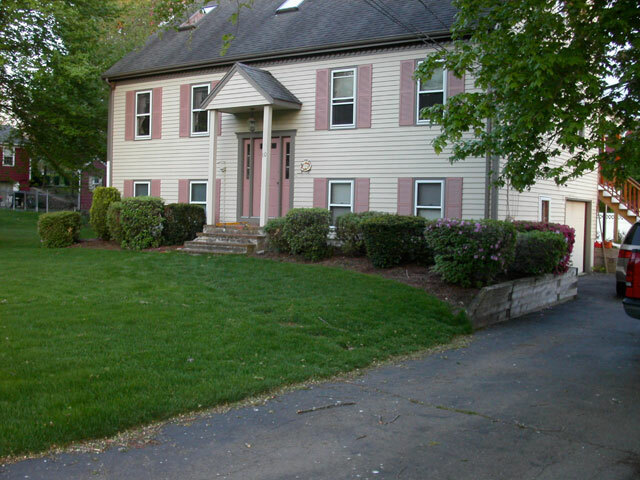 Note the granite landing and step that fit the period of this home build in the 1700's. The Goshen stone was set with a Bobcat. This original entrance was built with plenty of reinforced concrete but was unsightly and had only 3' wide steps leading to the driveway. The entrance steps are now 6' wide Caledonia granite with the lower steps curving toward the driveway. Full color bluestone is used for paving. Low voltage lights are placed under the wall cap and 'grandmother's tree' in the garden has up-lighting for a night time focal point. These very short walkways are quite attractive. The curved granite steps were quarried in Barre, Vermont while the darker granite steps were quarried in Deer Isle, Maine. The wider granite steps & new decking create a more welcoming entrance. The homeowners call these 'The Steps to Heaven'. They are functional and a very beautiful sight from inside their home. Caledonia granite steps with bluestone paving define a 'Work of Art' in this front yard. Note the curved granite step leading to the front door. 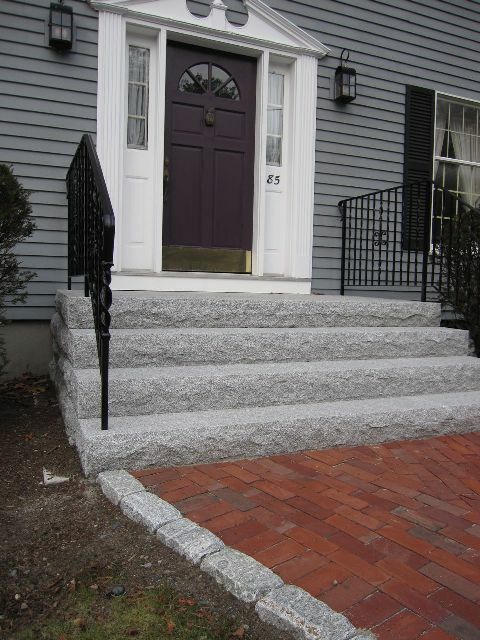 Granite steps look wonderful on any house and last forever. The top landing is 9' long by 4' 6" wide. This construction replaced crumbling brick steps and a bluestone landing. The large granite steps & landing will eventually support a portico. Pennsylvania fieldstone risers with bluestone treads sit atop an existing stamped concrete patio. 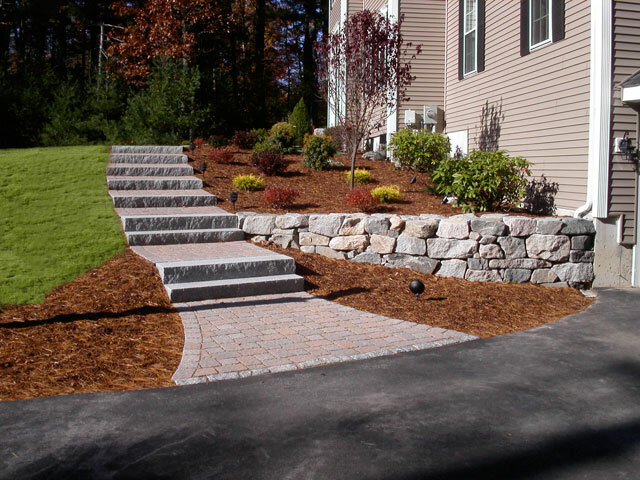 Thirteen granite steps with incorporated landing replace a steep driveway. Gently curving granite steps with granite lamp post at top. 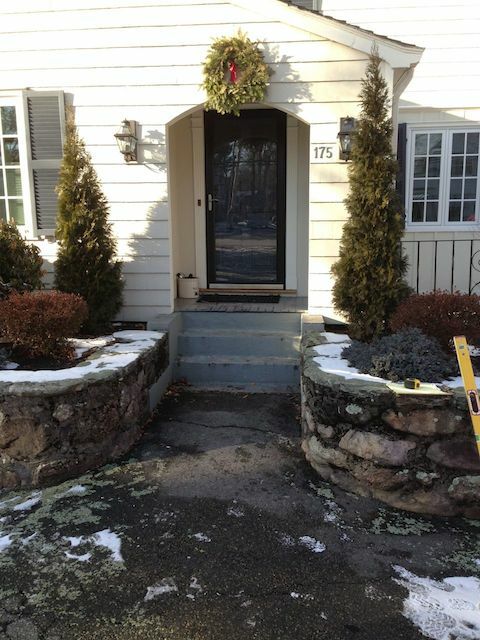 Below granite steps, full color bluestone landing transforms slope. Large, evenly spaced granite steps with brick paving lead up the slope. Large granite block walls complement the steps. 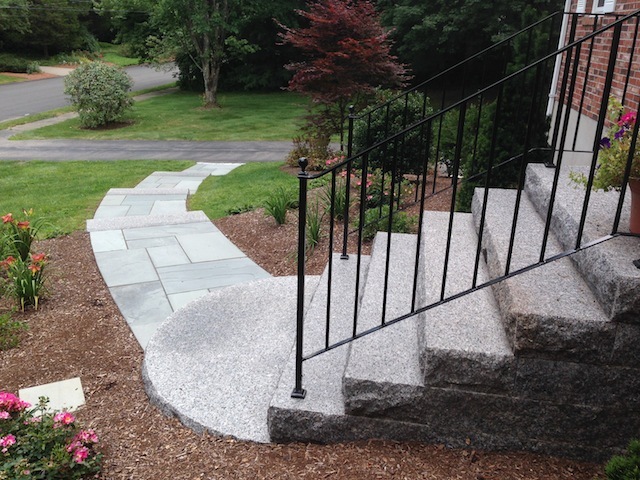 Full-color bluestone walkway with wide & deep granite steps will eventually support a portico. 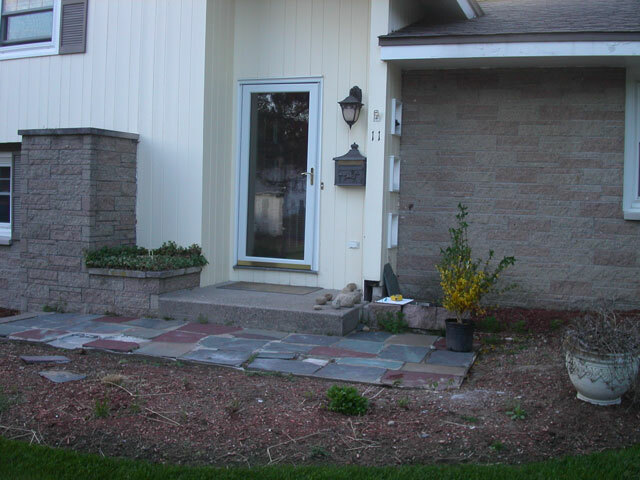 This concrete porch was covered with granite with another granite step leading to the door. 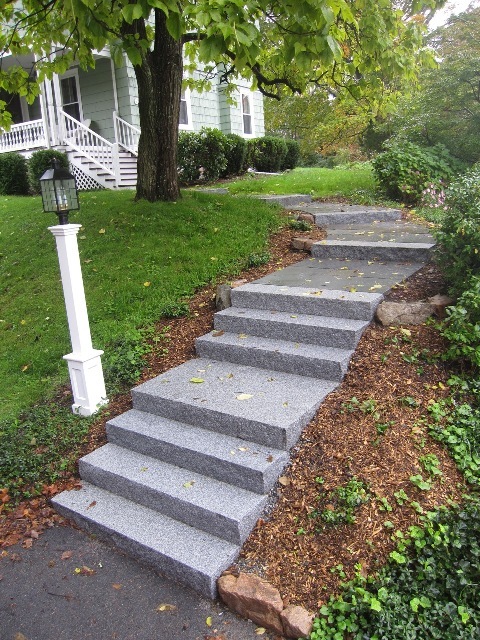 11-foot-wide granite steps replaced wooden steps to create a classic look. 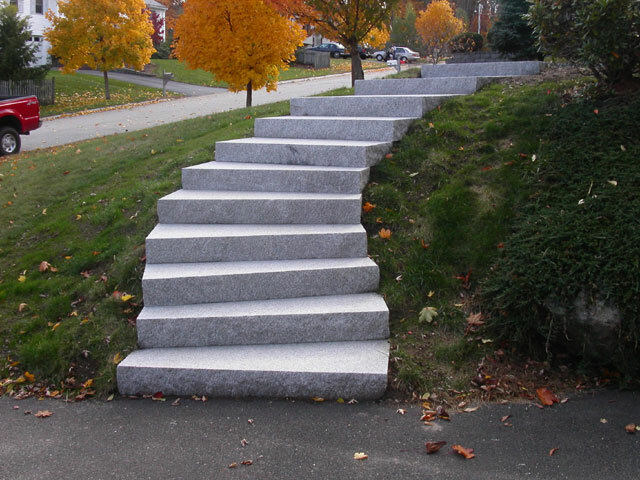 Rounded granite steps allow travel in two directions. 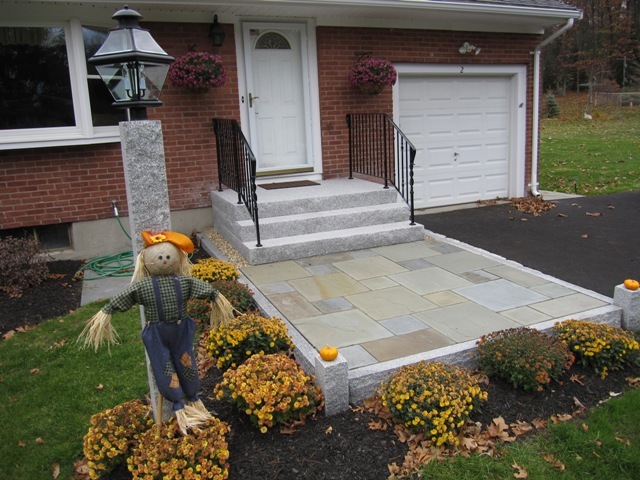 Large Caledonia granite steps & paving make an impressive entrance to this home. This bottom step has a 14' diameter with a full color bluestone landing area. steps make a 90-degree turn at the bottom.